Maude opened in February 2014 and I have been a local fan ever since. For the first four years, I would eagerly anticipate the new tasting menu that would feature a single ingredient as the inspiration. Every meal, I would marvel how they came up with the selected dishes, especially with such limited time. When Maude shifted to the great wine regions of the world, the team began visiting the regions for inspiration but then they would come home and create a menu based on their interpretations of their experiences. Again, I found myself in awe of the preparations and presentations, curious about the creative process. Well, this week Maude offered an “off-menu” meal, a sort of sneak peek into the next yet-announced wine region. This is the very first time that they offered this backstage pass and lifting the veil on their process. Getting an exclusive look at dishes and pairings as they are created in real time was a true highlight and that is why the Off-Menu Meal at Maude is the Please The Palate pick of the week. As Maude journeyed to a new wine region in the world for the fourth quarter of 2018, they landed in Piedmont, Italy. The most prestigious wine region in Italy, Piedmont, which means “foot of the mountains”, is between the Ligurian coast and the Alps in northwest Italy. Home to Nebbiolo and Barbera, as well as hazelnuts, cheese, chocolate and Alba white truffles, we were in for a treat. Sometimes there is perfect synergy in a wine and food pairing. It goes beyond just working well together to actually elevating both the food and the wine, resulting in only one response, “WOW!” These “wow” moments do not happen all the time and I had one this week. 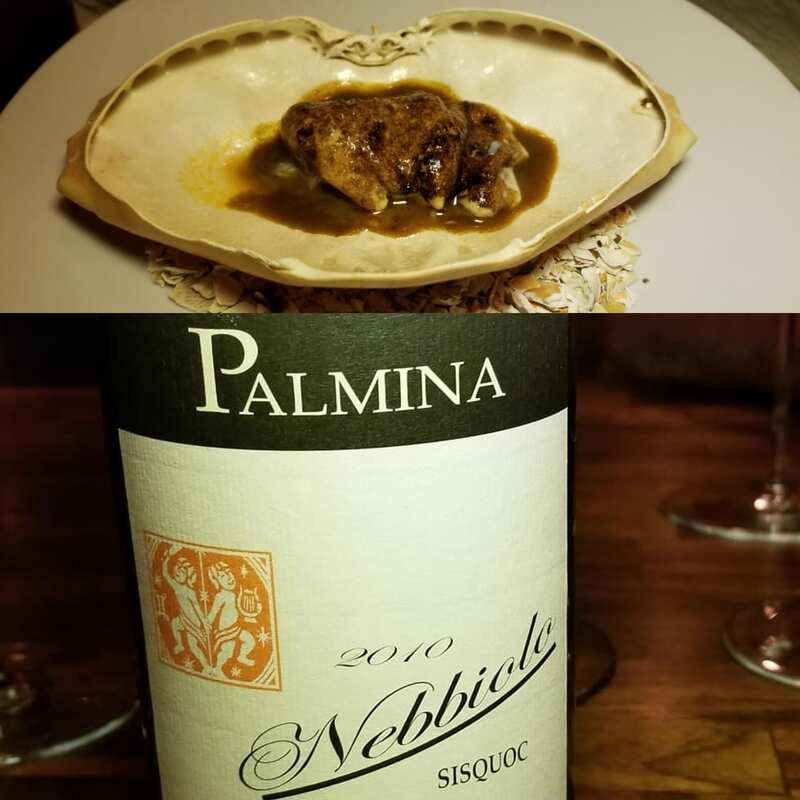 This perfect pairing of Palmina 2010 Nebbiolo, Sisquoc, Santa Maria Valley with Rock Crab with a truffle sauce at Maude Restaurant is the Please The Palate pick of the week.